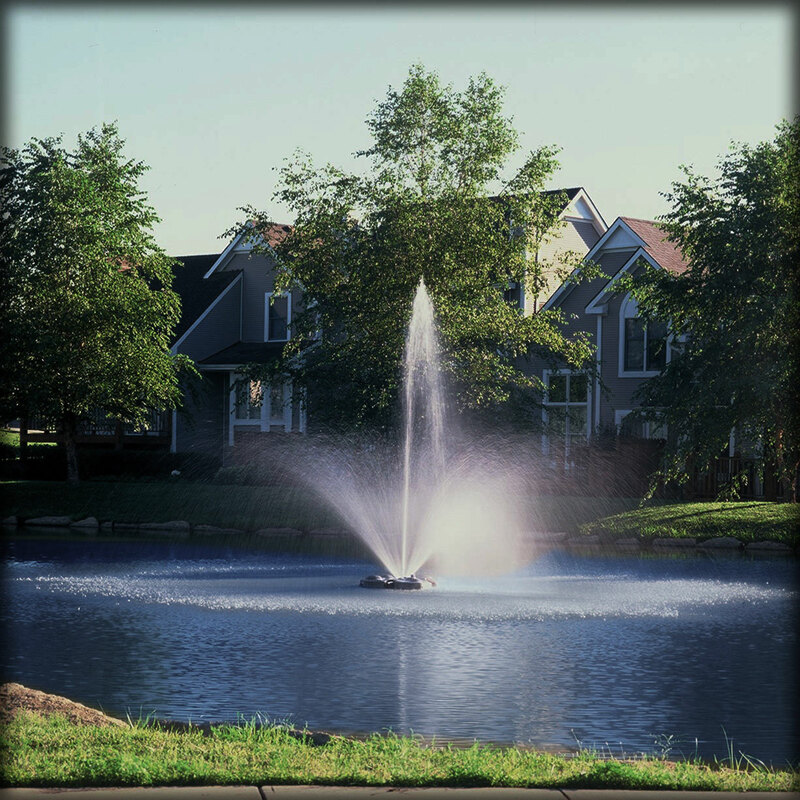 Fountains – Hoosier Aquatic Care, Inc.
Fountains can offer a nice touch to the looks of a pond and improves the quality of the water by avoiding stagnation. Hoosier Aquatic Care, Inc. offers a full range of fountain sales and repairs on existing fountains. We also offer a winter cleaning and storage program for our customers. A lot of thought needs to go into your decision to purchase a fountain such as; Is electric service in place within 25 ft. of the ponds edge or will you need a new electric installation? Or, what nozzle pattern do you prefer that fits within your budget? And, what horsepower is desired that fits the budget? Below is a list of the more popular nozzle patterns offered by some fountain manufacturers. The plume of Otterbine’s Gemini pattern offers incredible aeration strength and tremendous beauty to any property. Approx. 1 HP Spray Height and Diameter; 5 ft. x 10 ft.
Approx. 2 HP Spray Height and Diameter; 9 ft. x 16 ft.
Approx. 3 HP Spray Height and Diameter; 12 ft. x 24 ft.
Approx. 5 HP Spray Height and Diameter; 15 ft. x 34 ft.
Otterbine’s signature pattern, the Sunburst provides excellent aeration to any pond or lake while displaying a conservative yet striking pattern. Approx. 1 HP Spray Height and Diameter; 4 ft. x 15 ft.
Approx. 2 HP Spray Height and Diameter; 7 ft. x 24 ft.
Approx. 3 HP Spray Height and Diameter; 10 ft. x 30 ft.
Approx. 5 HP Spray Height and Diameter; 11 ft. x 40 ft. The Saturn is similar to the Sunburst but offers a more compact and lower profile pattern to provide another strong aeration solution. Approx. 1 HP Spray Height and Diameter; 1.5 ft. x 7 ft.
Approx. 2 HP Spray Height and Diameter; 3 ft. x 11 ft.
Approx. 3 HP Spray Height and Diameter; 4.5 ft. x 20 ft.
Approx. 5 HP Spray Height and Diameter; 5 ft. x 24 ft. The elegant beauty of the Tristar’s three-tiered pattern offers an excellent solution for those seeking to enhance their water feature. Approx. 1 HP Spray Height and Diameter; 8 / 5 / 3 ft. x 2 / 9 / 13 ft.
Approx. 2 HP Spray Height and Diameter; 12 / 7 / 4 ft. x 2 / 10 / 7 ft.
Approx. 3 HP Spray Height and Diameter; 16 / 11 / 7 ft. x 3 / 13 / 23 ft.
Approx. 5 HP Spray Height and Diameter; 19 / 13 / 8 ft. x 3 / 15 / 27 ft. Maintaining its symmetry and splendor, the Comet creates a thick, lavish column of water that will fascinate even the most discriminating onlooker. Approx. 1 HP Spray Height and Diameter; 9-11 ft. x 5 ft.
Approx. 2 HP Spray Height and Diameter; 16-18 ft. x 5 ft.
Approx. 3 HP Spray Height and Diameter; 19-21 ft. x 8 ft.
Approx. 5 HP Spray Height and Diameter; 21-23 ft. x 8 ft. The Rocket is a geyser-like pattern that looks beautiful by itself or clustered with other aerating fountains to create a more dramatic effect. Approx. 1 HP Spray Height and Diameter; 11-13 ft. x 5 ft.
Approx. 2 HP Spray Height and Diameter; 17-19 ft. x 5 ft.
Approx. 3 HP Spray Height and Diameter; 20-22 ft. x 8 ft.
Approx. 5 HP Spray Height and Diameter; 23-25 ft. x 8 ft. The Equinox offers beautiful symmetry from all angles and creates an intricate pattern that’s typically associated with architectural fountains. Approx. 1 HP Spray Height and Diameter; 10 ft. x 35 ft.
Approx. 2 HP Spray Height and Diameter; 13 ft. x 40 ft.
Approx. 3 HP Spray Height and Diameter; 15 ft. x 58 ft.
Approx. 5 HP Spray Height and Diameter; 20 ft. x 72 ft. Designed by KG Media Productions | Copyright 2016 Hoosier Aquatic Care, Inc.